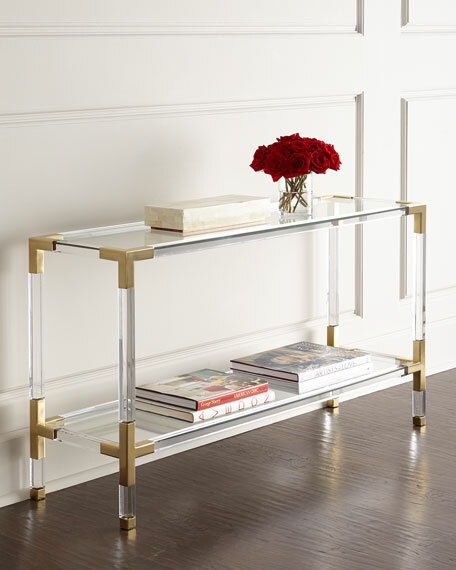 Acrylic frame with brass hardware insets. 50"W x 16"D x 28"T.
Handcrafted console. A multi-use cabinet featuring dark walnut and maple veneers with shagreen leather inserts. Brass pulls, adjustable shelves and wire access are included. Gmelina solids, maple veneer, walnut veneer and stingray leather. 72"W x 18"D x 30"T. Imported. Boxed weight, approximately 200 lbs. Buffet functions as an entertainment chest as well. Handcrafted of maple with alabaster finish. Metal base with decorative X-shaped stretchers. Armchair handcrafted of maple veneers with an alabaster finish. Upholstered slip seat with welt; circular wood-framed back with upholstered center panel with welt. 23.5"W x 25.75"D x 38"T. Imported. Boxed weight, approximately 35 lbs.